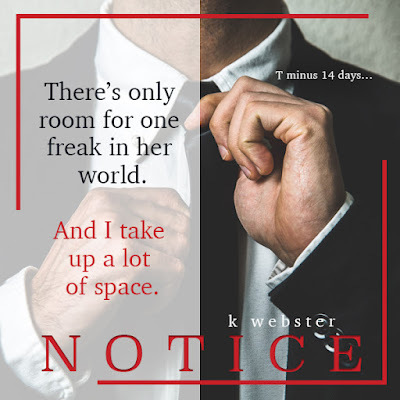 Review: Notice by K Webster | The Biblioholic ~ Read more. Sleep less. On my review, that is. That quote alone should let you know that K. Webster has definitely brought the krazy to this intense standalone. And if you're new to this author, welcome to the madness! 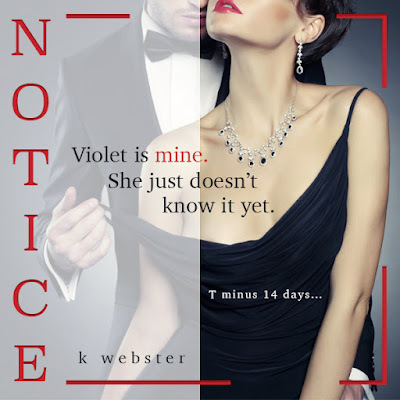 When Violet handed in her two-weeks notice to her boss of six years, her very hot boss who didn't seem to even know of her existence in all that time, he finally starts paying attention. So much attention that, unbeknownst to Violet, she's become Gray's newest obsession. Ever had someone lurking under your bed? Ever gone to bed clothed and woken up naked? No??? Strangely enough, I wanted to be Violet. What does that say about me??? To say I loved this story would be putting it mildly. While Violet irked me at some points because her logic didn't work for me, I still adored how this story played out. Well, I also expected more from the ending. Sue me, I'm picky. However, the plot was different than anything I've ever read and the author made it insanely easy to get inside Gray's head. And to fall for him! Or maybe I'm insane too. Maybe I've read so many of this author's work that I've become desensitized by the krazy. I don't know and I really don't care. I do know that I will ALWAYS read anything this krazy lady puts out and can't wait for the next stop on this train.